In this week’s newsletter adidas get out and about, Sweatshop gear up for the Summer, there’s an opportunity to volunteer at RideLondon, Mark Thompson knows everyone and I dish out some PSH love. On Saturday morning I awoke to the news that our founder Paul Sinton-Hewitt had been awarded a CBE in the Queen’s Birthday Honours list, for services to Grassroots Sport Participation. An amazing achievement and great recognition for what Paul and the rest of the parkrun community have achieved over the last nearly ten years. I first met Paul in August 2007 at a time when I was becoming increasingly disillusioned with not only our sport but the World in general. Everywhere I looked people seemed to be on the take, no-one seemed to be doing things simply because they were a great thing to do, most of the time you got what you paid for but even that seemed to follow the law of (rapidly) diminishing returns and it was becoming increasingly difficult to believe in organisations and their principles. When parkrun popped into my life I was suddenly presented with a (soon to be) national movement where people’s prime motivations were an altruistic desire to do something good in their community. No-one would make any profit and the core product was completely free. I’m sure that back in those early days - when despite only having a few hundred runners a week Paul felt there could be a parkrun everywhere in the World that someone wanted one - many people thought he was a sandwich short of a picnic. Some people still do. Here we are many years later however and the Queen herself will soon be affording him the title of Commander of the British Empire in recognition of his relentless pursuit of that very grand dream. There are of course many people along the way who have encouraged, guided and supported Paul’s vision. To date we’ve seen 60,055 different people volunteer for us in some way or another, but I’d like to take this opportunity to highlight the fact that out of all of us there’s only one person without whom we simply wouldn’t have our 283 (including junior events) amazing local communities. And that’s Paul. You could take any other one person out of the journey and although the landscape might have ended up slightly different, we’d all still be here. Although at first that might sound like I’m stating the obvious I don’t believe that many of the parkrun community are fully aware of the amazing sacrifices he has made so that we can all run for free and hang out with our mates (many of whom wouldn’t even be mates without parkrun) every weekend. For a long time he funded it out of his own pocket, it was many many years until he finally gave up his day job to become an employee and back in 2008 he gave up any opportunity he had to make a fortune, from what I believe is now the World’s largest running series, by setting up parkrun Limited as a not for profit organisation and gifting the UK rights for parkrun to that organisation. Last year he stood down as MD and this year he stood down as a director, completing one of the most altruistic acts I know of and handing parkrun UK over to all of us. Forever. For free. Of course, none of that could have been achieved without a laser-guided focus on his mission and a ruthless approach for things to be done his way. Paul and I haven't always seen the World the same way and those of you who know him well will laugh when I say he is more than capable of arguing black is white, even when it very clearly isn’t. But he lives parkrun every second of every day and his drive to do the right thing is stronger than in anyone I know. Time and time again he’s chosen the path of most resistance rather than compromise the (his) parkrun ethos that we all hold so dear. So, on behalf of myself and the parkrun UK family I’d just like to congratulate and thank the one and only PSH CBE for his wonderful gift that is parkrun. we’re coming... Finsbury Park and Barking! 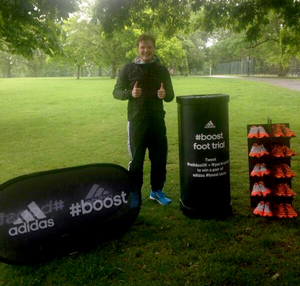 Adidas ambassadors are coming to Finsbury Park and Barking parkruns on the 21st of June - this weekend! We’ll be giving you the chance to try out adidas adios Boost during your run and giving away free shoelaces when you tweet using #boost. Keep a look out to see which parkrun we’ll be going to next! Do you enjoy camping? Like trail running? Think you can keep going for 24 hours? Then this is the competition for you! As sponsors of the adidas Thunder Run - a 24 hour trail running race in the heart of Derbyshire on the 26th and 27th of July, where teams of up to eight people run a 10K relay course with the aim to run as many rounds in 24 hours - we are running a competition for four parkrunners to win a place for two, plus kit, to take part in the ultimate running race! 2) Send a tweet to @adidasUK stating how you are all in for the adidas 24 hour race, using #allin24 and including your parkrun ID number. Entries close on Monday the 30th of June 2014 and winners will be drawn on Tuesday the 1st of July. P.S. Bagging a pair of Boost trainers each in the recent social media competition are Claire Price, Matthew Hope, Rachel Grant, Heather Rainsbury and Jon Bales. The lucky winners of the adios trainers chosen at random from the 11,235 parkrunners who PB’d on May the 31st are Alan Warmby, Andy Nye, Anna Maria Idec, Christine Newton, Emma Brashaw, Emma Green, Lee Hughes, Liz Moffat, Louise Vickerman, Paul Killgallon and Richard Wortham. Sweatshop would like to congratulate Paul Sinton-Hewitt on his CBE recognising his services to Grassroots Sport Participation and to thank all of the parkrun volunteers and runners who have made parkrun the success it is today. Sweatshop has been busy trying to reach more of you by opening new stores. With Notting Hill Gate in London, Oxford and Norwich now open, you can now find us in 40 locations nationwide and we will be opening more new stores soon. If you need an excuse to visit us our Sale Preview starts in store and online this weekend with savings of up to half price on running shoes and fantastic offers on clothing and accessories. Now is the time to get some new summer kit and pick up a great bargain at the same time. 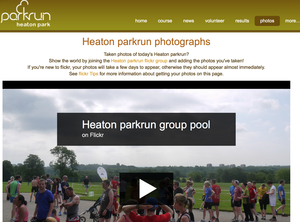 In addition to parkrun why not add another date to your weekly running diary this summer. Join our FREE Sweatshop Running Community which run from our stores and cater for all abilities. The organisers of Prudential RideLondon are looking for volunteers to be involved in a variety of roles across the Prudential RideLondon weekend on Saturday the 9th and Sunday the 10th of August. They will provide training and support to ensure you have an enjoyable time helping more than 75,000 people have fun on their bikes at the UK’s biggest festival of cycling. After the inaugural event in 2013, the vision for Prudential RideLondon to be one of the World’s leading cycling events has become reality. So if you’re a keen cyclist, a local resident or just love to volunteer, this is your opportunity to be part of this amazing event. Whether you fancy being involved in helping 50,000 riders to enjoy the traffic-free Prudential RideLondon FreeCycle event in central London on Saturday the 9th of August or you’d like to play your part in the Prudential RideLondon London-Surrey events on Sunday the 10th of August, there is a volunteer role for everyone. As a Prudential RideLondon volunteer, you’ll be more than just a spectator. You’ll find yourself at the heart of the excitement, working behind the scenes and on the frontline to help both the participants and the public to have a weekend to remember. There is a variety of roles for volunteers including wayfinders, pedestrian crossing point marshals, start marshals, yellow flag marshals, distribution of goody bags, rider support and more. Full training will be provided as required. And you’ll get an official t-shirt, cap, bag and lunch too! See Flickr Tips for information about getting your photos online. All photographs on our website may be downloaded for personal use but the copyright for the photographs remains with the photographers and you should get in touch with them (via the local event organisers) if you want to use photographs for any other purpose. Please check your event's news pages for the most up to date information. 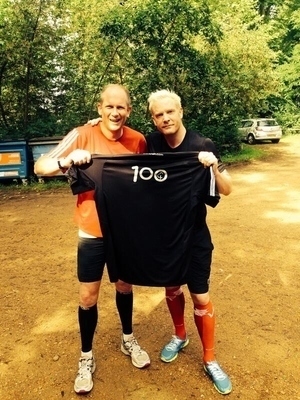 Two years ago as London 2012 approached, it seemed appropriate to make a New Year’s resolution and try parkrun as a way of getting fit and I was presented with my Club 100 t-shirt by Olympic, World, Commonwealth and European 400m medallist and fellow parkrunner, Iwan Thomas recently. I never thought my New Year’s resolution would lead me into coaching, forging some great friendships at Netley Abbey and beyond or meeting an Olympic medallist. I am so glad it did. It is therefore timely to thank Paul Sinton-Hewitt for providing us all with the opportunity to parkrun and to congratulate him on being awarded a CBE in the Queen’s Birthday Honours List. Well deserved. 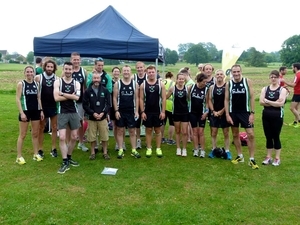 At Cheltenham parkrun, my local running club 'CLC Striders' took up the opportunity to fill all of the volunteer roles at parkrun on Saturday the 14th of June. We had such a fantastic response by the club, that we were able to hold the first ‘pacing day’ at Cheltenham with pacers from 19 minutes through to 30 minutes. The club really enjoyed the day with over 40 of our members supporting the event held in brilliant sunshine at Pittville Park. It was also my first time as Run Director too and I found it really enjoyable. The team worked fantastically together and made the results go smoothly. I highly recommend volunteering and would encourage everyone to try it! I have been trying to get my lad Coel to come out running for sometime and took him out one morning but it didn't go well. My other half tried the next day and he managed a full 5k. He then decided to do parkrun with a mate and I urged him to try to finish with a sprint. The stopwatch lady asked if he was my lad and I nodded. "He runs just like you" she said. I felt a lump in my throat, a very proud moment, and he had really enjoyed it too. Last week he ran in a torrential downpour and still loved it! A big thank you to everyone at Eastbourne parkrun. 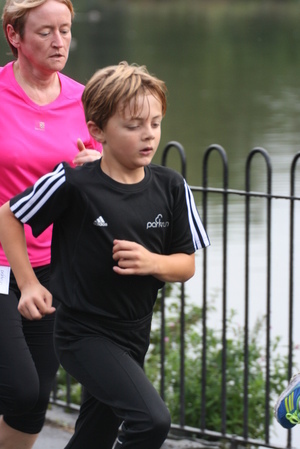 Despite the thunderstorm that engulfed Eastleigh parkrun recently whilst achieving her tenth parkrun under-18 parkrunner Caitlin Stewart was first lady across the line. Nothing remarkable in that as Caitlin has been first lady at Eastleigh before, but a minute later the second lady across the line was her mother Valerie in a somewhat older age category! On Saturday the 7th of June 2014 I attended the inaugural Humber Bridge parkrun and became the 9th male athlete and the 13th athlete overall to complete a global 'Cowell' - 100 global parkruns. 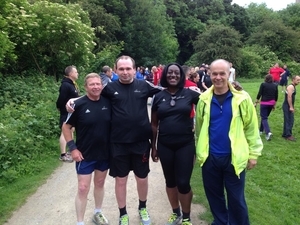 I would like to thank the Humber Bridge parkrun volunteer team for the warm welcome I received. Telford parkrun has been going now for a year and a half. There are lots of amazing people at our parkrun but I’d like to mention two people in particular; Chris Richards and Kim Fawke-Williams as without these two people there would be no Telford parkrun. Chris is parkrun mad and loves his role as Run Director. If there is anyone who hasn't been before he always gives them a warm welcome. Kim helped Chris set parkrun up and she is really helpful and she never gets much praise so I hope this helps! 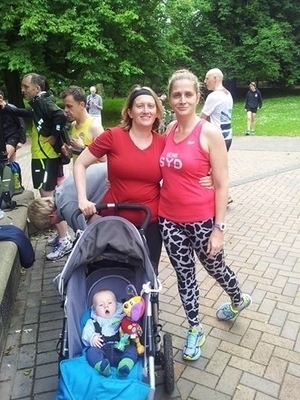 My sister-in-law Louisa Moore is becoming a regular at the Cannon Hill parkrun with her six month old son, Jasper. On May the 31st it was a special occasion as Louisa's sister Claire, a regular at the St Peter's parkrun in Sydney, had come across the World to meet her new nephew. The run was a family affair as both aunties, mum and baby (in buggy) all took part. Claire zipped round in just over 22 minutes, whilst Jasper just beat his mum home in around half an hour! Two years ago I caught pneumonia and was in hospital for nine days and off work for five months recovering and as part of my path back to fitness I challenged myself to take part in a half marathon which I completed. After that I joined Peterborough parkrun in January 2014 to get me out and about. I have stopped smoking, taken part in many races and now have a parkrun PB of 20:15. I would not have achieved this much without parkrun. What do you do at parkruns: I meet my friends (there are four or five from my class) and we play in the playgrounds and have fun, then at the end my friend Ben and I go to the cafe for a drink and a bacon bun. How has parkrun changed your running: I started parkrun when I was 4 and started just doing 1k and then 3k. At my first 5k I ran 44:28 but my PB is 22:26 now. I want to get faster and beat my Dad's PB. I beat my Mum's ages ago! What do you like about parkrun: Meeting all my friends and beating my Mum and Dad, especially with sprint finishes. Most memorable or funniest parkrun moment: Running my 100th run was really great and getting to hold an Olympic torch when someone brought one to our parkrun. About four years ago I discovered parkrun in Coventry. Fast forward to May this year, and 25 different locations later, I achieved my 100th finish at Southwark parkrun. I am thrilled to have reached this milestone and will wear my t-shirt with pride. After all, that means I have done about 12 marathons worth of parkruns! I have been asked why it took so long to get there, and also did I wish that I had run more events so that I could have got there sooner. For me, the t-shirt is recognition of an achievement, but it was never an objective. I knew I would get there eventually, but didn't really mind when. Most of the weeks I don't run because I volunteer in some capacity. And I get just as much enjoyment from this, probably even more so than running. On an average Saturday at Braunstone we get 300 runners and I know at least a third of them by name. I know people involved with other parkrun events stretching from the North of Scotland to the South West of England. I know all the staff involved with the organisation of parkrun, and get to understand more about what goes on behind the scenes. None of that would have happened if I had just run every week. So no way do I regret how long it took to get to 100 runs as the people I met on the way as a result of volunteering more than makes up for it. That leads me to my last point. One of the people that I have met on the way is Paul Sinton-Hewitt, and a nicer, more humble man you couldn't wish to meet. But what he started is now a significant factor in the lifestyles of people of the UK and beyond. So on behalf of all of us parkrun UK Ambassadors, congratulations on your well deserved CBE. Every parkrun event relies on volunteers and in 2013 alone over 33,000 of you came forwards and supported your local event. Volunteering is a wonderful way to make friends, feel great and have fun. If that sounds like it's for you then please contact your local event team for more details. Children under the age of eleven must be accompanied at all times by a parent, guardian or appropriate adult of the parent's choice. It must also be ensured that children place themselves appropriately at the start so as to prevent a situation where they are being repeatedly overtaken. This is to ensure the safety of your child.